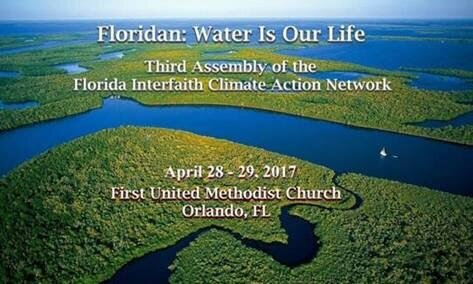 April 28-29: Florida Interfaith Climate Action Network Assembly, Orlando. People of all faith and ethical traditions -- and all others concerned -- are needed to work together on critical climate-related issues in Florida. This year’s focus: Floridan: Water is Our Life. Join us for this important assembly April 28 at the First United Methodist Church, 142 East Jackson Street, Orlando, FL 32801. All interested may stay overnight at a local hotel and join the People’s Climate March in Orlando April 29. Register here: www.interfaithflorida.com.